This afternoon I’m giving a guest lecture on jazz to the Western Carolina University’s Instrumental Methods class. Much of the lecture will be a “hands-on” improvisation primer that will cover some basics of improvisation in a setting that can be done in a non-jazz instrumentation, such as with a concert band (or Instrumental Methods class). In addition to getting the future music educators going with improvising and how to introduce improvisation to their future students, I will be going over a basic primer in teaching jazz at the middle school and high school levels. In order to make it easier for the students to find this information and other good resources, I’m going to post a summary of this part of my lecture here. First, if you can find it, I recommend an excellent book written by John Berry called The Jazz Ensemble Director’s Handbook. It’s a great resource for new teachers, even those who are already experienced jazz performers. It deals with common problems and practical solutions for getting good musical results from young jazz students. Another good resource is The Creative Director, Alternative Rehearsal Techniques by Edward S. Lisk. This text is written primarily for the concert band director, but it does contain some helpful advice for jazz ensemble rehearsals and the general advice in there is golden. Just as the concert band is the core group of your instrumental music program, the core group of any jazz program is usually the big band. The big band instrumentation is different from a concert band, however, in that even though we tend to think of it as a “large ensemble,” it’s really a chamber ensemble in practice in that there is really only one player per part. This makes it a rewarding challenge for the students, and sometimes a real headache for the director with too few, or too many, students to put together a balanced instrumentation. The traditional instrumentation of a big band is five saxophones (two altos, two tenors, one baritone), four trumpets, four trombones, piano, bass (preferably someone who can play both upright and electric), guitar, and drum set. An auxiliary percussionist can also sometimes be added who can play latin percussion instruments and/or vibraphone. Substituting other instruments (such as baritone horn for a trombone or clarinet for a saxophone) can work, but isn’t recommended if you’re using standard big band charts. My recommendation is that if you have an interested student who doesn’t play one of those instruments and have access to instruments to rent out, start them doubling. They might really enjoy learning a secondary instrument and if your student is like me, they might just end up switching their primary instrument around (I was originally a trumpet player, then baritone horn player before getting encouraged to try out trombone in my high school jazz band). Adding extra instruments to your band is a possibility, in certain circumstances. You can easily add a fifth trumpet and fifth trombone to your brass sections and many charts exist that already have that instrumentation, not to mention that it will help you spell your players with demanding parts. It can also help strengthen your sax section to add an extra alto and/or extra tenor, but this can get unwieldy with any more. It’s probably best to save this for the less experienced bands and use one player per part for the more advanced jazz ensembles. Auditioning students for particular chairs is a little different from how you might place them in a concert band or wind ensemble instrumentation. In the sax section your lead voice will be the 1st alto. You want your most consistent and confident player on this part, if you can. Your bari sax also should be a strong player. Your best sax improvisor should go in your 1st tenor chair, which is probably the main solo chair in the whole band. The 2nd tenor part is generally pretty challenging, so you’ll want to help this player out as much as possible. You might be able to best get away with assigning your weakest saxophone student to the 2nd alto. You’ll want your strongest trumpet student with the best high chops to go on 1st trumpet. The 2nd trumpet chair is the main solo chair of the trumpet section. If you use five trumpets, assign your assistant lead player to the fifth part, as this is often the “screech” chair with five part charts. When you’re playing charts that have only four trumpet parts you can have this player help cover lead parts to rest your 1st player or have him double the lead part down an octave, where appropriate. The trombone section is similar to the trumpet section, except that improvised solos seem to get placed in the 1st and 2nd trombone parts almost equally. The fourth part is typically a bass trombone part and should be played on a bass trombone, if possible. You might be able to get away with a student playing this part on a large bore tenor with an F attachment, but it’s not preferable. If 5 players are used often times the 4th and 5th parts are both bass trombone parts. When playing charts with only 4 parts it’s usually safest to have the extra player double the 3rd trombone part, taking care to blend and not unbalance the rest of the section. There are many variations to the big band setup, but the most common one and the one I prefer is this one. This setup places your lead players in each of the horn sections in the middle of the section and your main soloists closest to the rhythm section. The lowest horns, bass trombone and bari sax, are on the opposite side of the bass, which helps to level out the low end listening out front. The bassist gets placed in between the drummer and pianist, allowing him or her to really lock into the drummer’s time and the pianists comping. I know some players who prefer to put the bass on the other side of the drums, so I usually leave this option open if the students prefer it. The micing I’ve placed on there are strictly for solo reinforcements, and should be modified according to who in your band solos on any give concert. You’ll probably also want to put some mics on your piano, if you’re using an acoustic piano (always preferable). The trombone mic can be placed between the 1st and 2nd player to give them both easy access for solos, but I’ve placed the mic there because when I direct the Asheville Jazz Orchestra I normally play lead trombone and also use the same mic to make announcements from, so that’s where it’s set up in my stage plot. Unlike the horn sections, which most music education majors get a little background with in pedagogy class, the rhythm section is one of the most challenging sections to teach. Each instrument in the section has it’s own unique role to play which can be a mystery to a new band director. It’s a lifetime worth of work just to figure out one of those instruments, let alone all four, but here is some basic advice for working with your rhythm sections. Their primary focus should be on playing the time. In almost all cases, less is more. Younger players who have some chops will tend to overplay and do too much. Get them to back off and play “four to the floor” whenever appropriate. Have your drummer practice keeping time with only the high hat and ride cymbal. Teach him or her how to “feather” the bass drum so it only subtly reinforces the bassist. 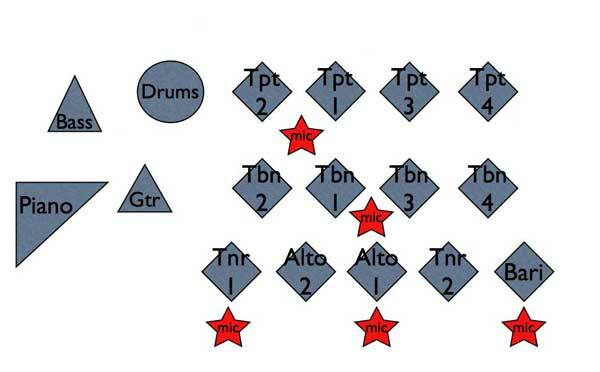 Insist that your drummer blend and balance his or her dynamics with the rest of the band. Drummers have perhaps the widest dynamic range available of all the instruments in the jazz ensemble, but inexperienced drummers tend to only make use of the loud end. The bassist’s role is similarly to keep the time. Many charts for young bands have bass lines written out, but it’s a good idea to learn some of the basics on how to construct a good walking bass line. Here’s a nice introduction to get you started. If possible, most jazz charts are best played on an acoustic bass with a pickup mic, but an electric bass can work pretty well if the E.Q. levels are set appropriately. Start with all levels at mid range and then adjust according to the room from there. Help your bassist avoid the temptation to crank up the low end, which sounds unstylistic. The guitarist can play a couple of different roles with a big band. Sometimes the guitarist will have a written out line, either with the horns or as part of the general rhythm section groove. Help your player learn to read music and don’t let him or her hide whenever a written out line is called for. When the guitarist is called to comp, he or she should learn jazz voicings and move away from bar chords and open chords that tend to be more familiar. Many swing charts, particularly those with a Count Basie feel, call for the guitarist to simply play chords on all four beats and act more like the ride cymbal. There are other times when the guitarist can vary the rhythms more, but less is usually more. Like with the bass, set the E.Q. of the guitar and amp at pretty much mid range first and adjust slightly from there. Like guitarists, pianists often get called to play written lines, usually as solo melodies, but are also called to comp. You’ll want to help your pianist learn how to voice out chords so that they aren’t always played in root position. You might also help out your pianist comp by writing down some basic rhythm patterns that he or she can play for various grooves. Get your pianist to stay off the sustain pedal, with the possible exception of playing ballad solos. There’s almost no need for the sustain pedal in most big band playing. While most rehearsal needs and techniques from the concert band also apply to the jazz ensemble (intonation, balance, etc. ), jazz articulations need some mention here as they are a very important part of the jazz language and they are in many ways quite different from standard articulations. In general, jazz players need to tongue harder and release the notes much more abruptly than in the concert band. There are several books and web sites that cover how to interpret the articulation markings in a jazz ensemble. John Brye of the Jazz Ambassadors has put together a nice one here. A friend from grad school (Ball State University), Dr. Todd Kelly has put together a PDF file that is available here. One trick I’ve found helpful is to get your horn section to exaggerate every articulation more than they think they need to. I suggest that if I were to individually mic each player and record everyone that I should be able to solo any individual player and the articulations would be too short, too hard, etc. When everyone plays like this as a unit the articulations come out just right. I would argue that the single most important thing you can do to help improve your jazz ensemble’s playing is to play jazz recordings for them. You may be able to find recordings of the exact same music you’re rehearsing with them, but even just recordings of similar styles can go a very long way in helping your students learn how to play stylistically. I simply cannot emphasize this enough. Jazz, like all music, is an aural art form and in order to play it well you need to understand what the tradition calls for it to sound like. You might feel that your time should be spent getting your students to rehearse, but I’ve found that 5 minutes of focused group listening followed by a few minutes of discussion on what the recording can teach is often worth 20 minutes of rehearsing. Encourage your students to listen to jazz outside of rehearsals and your group will really take off. This really deserves a more complete discussion than I will offer here. I have a few resources on improvisation here and here. Let me just add now that you can easily teach improvisation skills during a brief warmup to every rehearsal and getting everyone to participate by improvising either collectively or trading very brief solos is a great way to introduce ear training and music theory. Some charts lend themselves very well to opening up for alternate or additional solos and whenever possible, encourage students who don’t normally play a solo chair to try out solos in rehearsals, if not on concerts. In recent years there have been some very nice methods that have come out for young jazz students. Alfred Music Publishing has two nice ones, First Year Collection for Jazz Ensemble and Best of Belwin Jazz: Jazz Band Collection for Jazz Ensemble. Both collections have about 10-12 easy to play charts, including some optional parts for flutes, horns, baritone horn in treble clef, and tuba. They are both perfect for the middle school level. A more involved one that is a good start for middle school bands with more time or beginning high school bands is the Standard of Excellence Jazz Ensemble Method. Another friend of mine, Jeff Anderson, has posted a great essay for jazz ensemble directors on The 10 Most Common Mistakes That Jazz Band Directors Make (and how to fix them). Rather than duplicate it here, I recommend you go check it out from the original source. I’d just like to close with mentioning one of them in particular, never using outside help. College music teachers are almost always willing to play hooky from their classes and go visit high school and middle school bands to help out. In many cases, they will also bring along some of their students to play for yours. Bringing in an outside expert can be one of the best things you do to fire up your students and get them excited about playing. Not only will these teachers be often able to bring something to your rehearsal that you might not yet know about, but they will often reinforce what you’ve been teaching in a way that is just different enough that it will click with your students. It can also be a good learning opportunity for you to observe how someone else rehearses problems that you’ve been struggling with. As a college music teacher, I’m always surprised at how little I’m asked to visit some nearby high schools and middle schools. I’ve called directors and offered my services, “whenever you want” and never heard back. I’ve taken to sometimes simply finding out when the band rehearses and then calling the director up to say that I’ll show up at the next rehearsal, just to get my foot in the door. It’s in our best interests to help out our high school and middle school colleagues because it’s those programs that feed into ours and we want to recruit your best students. Take advantage of what’s usually a free resource. As I wrap up this post I’m already thinking of other things I feel I should add and other online, print, and audio resources (such as play-a-longs like Smart Music, Band-in-a-Box, and Jamey Aebersold books/recordings). If you know of something you’d like to share, please leave it in the comments section below or contact me and I’ll add it when I find the time to update this post or write a followup. As a middle school teacher, I find that my local HS and college resources are very scarce!! Any ideas on opening lines of communication??? I’ve tried many times… SO MANY of my outstanding students do not continue because of the unknown. Sounds like I have the opposite problem. Can I be your feeder School??? That’s surprising to me. Do any of the high schools or colleges in your area have festivals you can take your middle school bands to participate in? Sometimes colleges focus on recruiting at the high school level and forget middle school students. What about county/district/state festivals through your state NAfME chapter? Sometimes colleges from a ways away will take ensembles on tour, so maybe check with some schools outside your area and invite them in to perform or clinic at your middle school. This is awesome. I am planning to start a jazz big band here in the city of Gaborone , Botswana and i found this information very helpful. Thank you so much. I will visit other sites you have mentioned and even get books. Great article! Especially liked the book resources. Hadn’t heard of one of them, so thanks! Another superb resource is “Jazz Pedagogy: The Jazz Educator’s Handbook and Resource Guide,” by J. Richard Dunscomb and Dr. Willie L. Hill, Jr. (link: https://amzn.to/2q0D1Is). Good article. A couple of rhythm section issues – I think the bass and drums in the chart should be switched around. I used to put the bass amp next to the 2nd trumpet and the player next to the 2nd trombone. The reason for this is to put the bass sound between the solo chairs (tpt. 2, tbn. 2, tenor 1) and drums. Also, put the guitar next to the 1st tenor.